OK Relax… If we cannot recover the data – no one can! Call us and speak to a RAID Expert. RAID Data Recovery is one of the specialties of the various data recovery services offered by WeRecoverData.com. RAID is a great system for increasing speed and availability of data as it offers considerably more data protection than non-RAID disk systems. However, its management of the disks and the data distribution across them can be extremely complex. Being the industry leaders in data recovery, the recovery specialists at WeRecoverData.com can propose cost effective recovery solutions for your data recovery requirements. Contact WeRecoverData.com for your RAID recovery. TIP: How to choose the right company to perform RAID data recovery service? If a company asks for the RAID controller, do not use them. The RAID Controller is not required to perform the recovery if the company that is attempting the recovery knows enough about RAID systems. When a customer is sending the equipment to a data recovery company, most companies who claim to perform RAID recoveries will require the RAID controller. That means that they do not have the capabilities to do the recovery without the controller or don’t have the knowledge to perform an advanced recovery from the array. They will most likely need the RAID Controller to identify the parity information or to use the controller to try rebuilding the array. These are simple steps that only work for very limited types of cases. This process can potentially damage the success of any future recovery, if done wrong. Also in most cases this attempt will not be successful due to drive corruption, which is the most common reason for arrays to fail in the first place. We receive a large number of cases from customers who sent RAID arrays to other companies to attempt a recovery, and in many of them the data is lost forever due to failed recovery attempts. Advanced knowledge and experience with file system formats at the sector level is critical for all recoveries. Understanding the HEX/Binary format at the lowest level that exists in file-systems in general, and in particular for RAID arrays, is essential to the success of the recovery. The vast knowledge we have help us recover NAS or complex SAN devices which are using non-standard, proprietary or modified file systems . ” All our data is fully restored, and we’re back to normal. Thanks so much for saving our business! We were in the middle of changing our office domain, and our main file server went down, evidently a physically damaged RAID. Then we discovered that the tape backup had not been functioning properly, so we’d lost about 5 month’s work. One of the things the disc had contained was a huge database for our major client (The Coca-Cola Company ) , and it was almost time to deliver it to them. If we couldn’t get our data back we would almost certainly go out of business. Q: We re-striped/re-initialized the RAID array, formatted the array and copied data back to it. Is there a chance of recovering the data from before the array was re-striped/re-initialized? A: It’s still possible to recover the data on these cases. It will depend on the RAID controller’s functionality and how much data was copied to the array. Contact us to determine how we can help you in your RAID data recovery process. Q: 2 drives we down and are not recognized by the system in our RAID 5 system, can you still recovery it? A: It’s still possible to recover the data on these cases. We will have to create clones of the original drives with our equipment after disassembling the drives in the clean room. Then with the clones we will rebuild the RAID array using our proprietary procedure. Please send us all drives that were used in the RAID system, we will need all of them to recover the data. (rād) Short for Redundant Array of Independent (or Inexpensive) Disks, a category of disk drives that employ two or more drives in combination for fault tolerance and performance. Striped Disk Array without Fault Tolerance: Provides data striping (spreading out blocks of each file across multiple disk drives) without redundancy. This improves performance but does not deliver fault tolerance. If one drive fails then all data in the array is lost. Mirroring and Duplexing: Provides disk mirroring. Level 1 provides twice the read transaction rate of single disks and the same write transaction rate as single disks. Error-Correcting Coding: Not a typical implementation and rarely used, Level 2 stripes data at the bit level rather than the block level. Bit-Interleaved Parity: Provides byte-level striping with a dedicated parity disk. Level 3, which cannot service simultaneous multiple requests, also is rarely used. Dedicated Parity Drive: A commonly used implementation of RAID, Level 4 provides block-level striping (like Level 0) with a parity disk. If a data disk fails, the parity data is used to create a replacement disk. A disadvantage to Level 4 is that the parity disk can create write bottlenecks. Block Interleaved Distributed Parity: Provides data striping at the byte level and also stripe error correction information. This results in excellent performance and good fault tolerance. Level 5 is one of the most popular implementations of RAID. Independent Data Disks with Double Parity: Provides block-level striping with parity data distributed across all disks. A Mirror of Stripes: Not one of the original RAID levels, two RAID 0 stripes are created, and a RAID 1 mirror is created over them. Used for both replicating and sharing data among disks. A Stripe of Mirrors: Not one of the original RAID levels, multiple RAID 1 mirrors are created, and a RAID 0 stripe is created over these. EMC Corporation’s proprietary striped parity RAID system used in its Symmetrix storage systems. We experienced a MASSIVE RAID failure on Whonnock server and lost a crapload of data. Can we get it back? 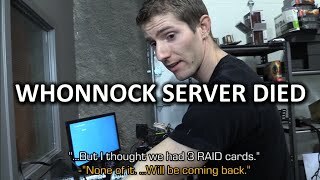 Linus Tech Tips Video - Remote RAID Recovery!